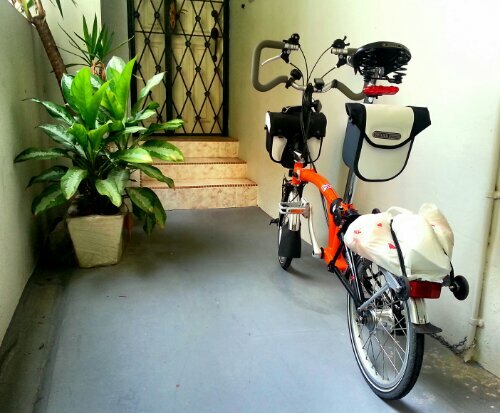 Besides carrying bags at the front of the Brompton, bags can also be placed at the rear. 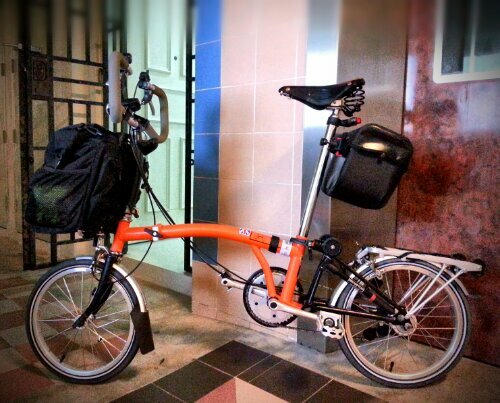 So far there is only the Rack Sack which can be mounted to the rear of a Brompton, which must also has a rear rack. What if there is no rear rack? There is an adapter in the market called Klickfix, which allows Ortlieb handlebar bags to be mounted on it. I managed to get my hands on a pre-owned Klickfix Caddy Adapter and a Ortlieb Ultimate 5 Classic bag. Loving it as it allows me to be able to carry more stuff, without having to use a Rack Sack or T-Bag which is enormous as compared to the other bags. The Ortlieb Mini-O bag in front is made by Ortlieb specifically for Brompton. The rear bag is a Ultimate 5 Compact, allowing me to put my wallet, keys, shades and mobile phone in. This leaves the the Mini-O to hold larger and bulkier stuff such as any takeaways I get along the way. If the Mini-O is full, I still have the elastic ropes and the rear rack to hold some stuff. Here, the front is a T-Bag carrying punnets of fruits I brouhht along for a gathering. The rear is a Ortlieb Ultimate 5 Classic bag carrying my essentials and a Kathmandu dry bag which allows me to keep my stuff in it if it rains. I have quite a number of bags I use on the Brompton, ever since we got the Bromptons. I must say there is a use for each bag for different occassions. Do you mind if I quote a few of your articles as long as I provide credit and sources back to your website? My blog is in the exact same niche as yours and my visitors would genuinely benefit from a lot of the information you provide here. Please let me know if this alright with you. Thanks! Thank you. Hope you enjoyed reading this blog. I just want to tell you that I am just very new to blogging and truly liked you’re web site. Most likely I’m going to bookmark your blog . You certainly come with terrific articles and reviews. Bless you for sharing your web-site. Thank you Chong. Glad you like it. 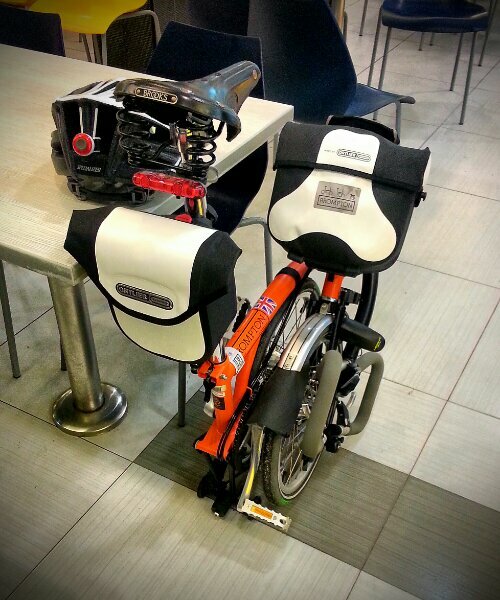 Hi, I would like to find out how exactly did you fit the Ortlieb Ultimate (the normal Ortlieb, not the one made especially for Brompton) in the back of the saddle). Hi. I used a seat post mounted Klickfix Caddy adapter to hold the Ortlieb Ultimate at the rear. sorry if i may ask what bracket are you using for the ortlieb on your seat post. Hi. Thank you for visiting. I used the Klickfix Caddy Post and Bar Clamp.